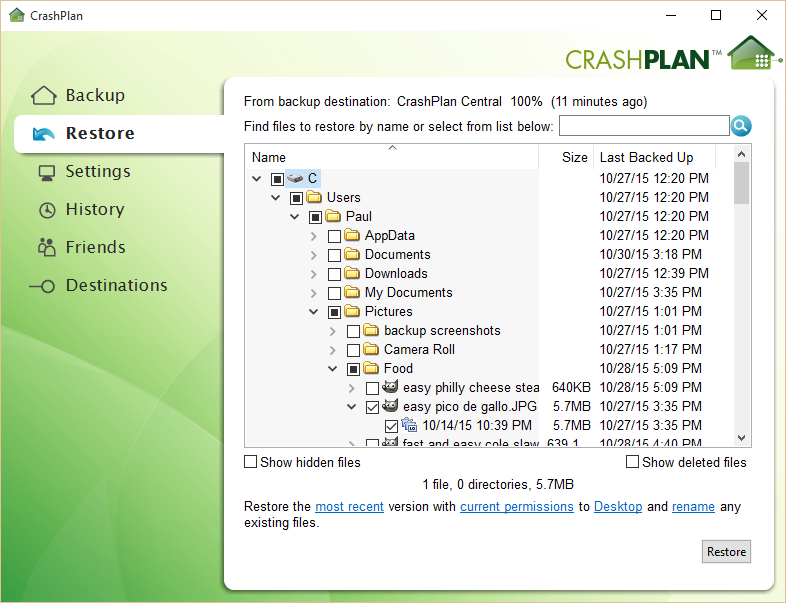 Crash Plan Review 2016 | Is this Online Backup Any Good? 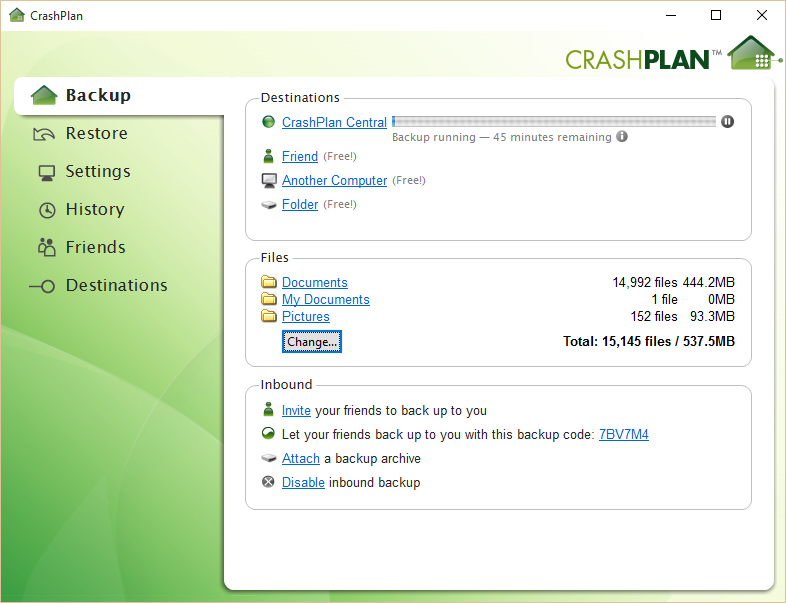 Crashplan lets you back up to any destination, with rich features and strong security for both free and paid users. Here’s something you won’t see most online backup providers offer: Crashplan is completely free to use if you have your own storage–local drives, external hard drives, and even friends’ computers–and you only need pay if you want to back up your data to the company’s cloud servers. Whether you seek a fast and intuitive plug-and-play backup solution or you want to adjust and tweak every last detail of your upload, Crashplan strikes the perfect balance between simplicity and control. Unlimited cloud storage on a single Mac, Windows, or Linux computer starts at $60 per year (GBP 38.80) or $5.99 (GBP 3.88) per month. For a family plan, $150 per year (GBP 97.04) or $13.99 (GBP 9.05) per month will let you back up a maximum of 10 computers. Crashplan offers a 30-day free trial if you want to give cloud storage a try, no credit card required. The free version (not the free trial version) lets you use Crashplan to backup your computer to your own storage devices, but not Crashplan’s servers. It comes with 128-bit file encryption, once-daily automatic backups, and even basic customer support in the form of a ticket submission system. Paid users, including those on the 30-day free trial, get 448-bit file encryption, continuous backups, and customer service by phone. A paid subscription also lets you use Crashplan’s mobile app, from which you can view and download files from your backup onto your smartphone. All file sizes and types are fair game, including video, but Crashplan says it isn’t designed to back up system and application files. That means a full system restore isn’t really an option. The ability to back up your files to pretty much any destination you want is a key differentiator that really sets Crashplan apart. If you want to back up your files to a friend’s computer or just to a spare you keep lying around in the house, just connect both to the internet and input the source computer’s six-digit code in the Crashplan settings onto the destination computer. You can request that your friend add the code via email. Both parties can specify when backups occur and where they are stored. Because the data is encrypted before leaving the original computer, your friends still can’t access your files. Deleted files and previous versions can be recovered for as long as you use the service. Crashplan lets you specify how often to archive a previous version based on how old the file is. For example, if a document is less than a week old, back it up every 15 minutes. If it’s up to one year old, back up another version once a week. Deleted files on the local drive are never removed from the cloud backup by default, but you can set it to permanently delete them after specified period. This is a level of detail you don’t often see from online backup providers, so much so that it often seems unnecessary. For example, will I ever really need to turn off encryption or de-duplication? In any case, it’s easy enough to avoid the settings menu altogether and just run with the defaults. Files of a certain size or extension can be filtered out of the backup, saving time and bandwidth. You can pause backups from the system tray or set times for Crashplan to automatically halt when you need bandwidth the most. Crashplan also lets the user tweak how much CPU power should be used when the computer is active and when it’s idle. 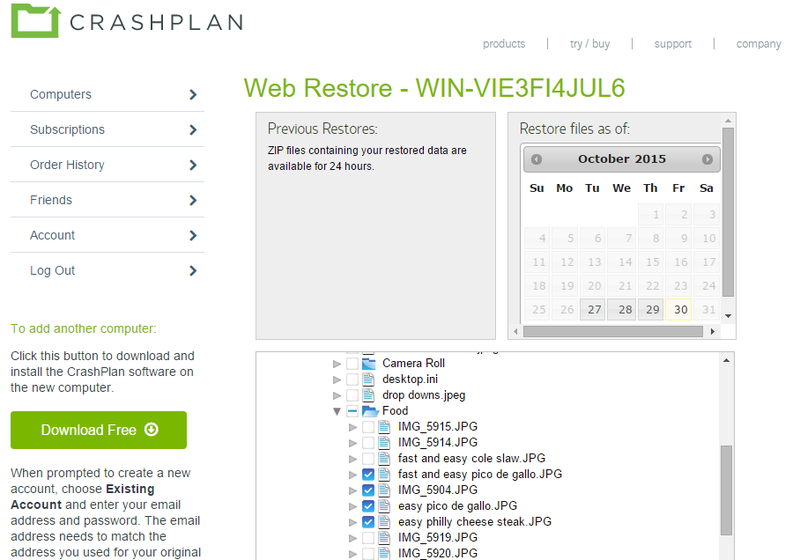 All files are compressed before uploading, and Crashplan is among the fastest consumer backup services out there. Crashplan’s free tier will use 128-bit encryption to protect data, while a paid plan bumps it up to 448-bit Blowfish. Most of Crashplan’s rivals opt for the AES encryption standard rather than the aging Blowfish, but 448-bit Blowfish is still just as secure as 256-bit AES for most purposes. Most hackers and cryptographers today target AES more than Blowfish. All data is encrypted on the local machine first, then protected by SSL when being transferred to the final destination. Crashplan also allows the user to choose between the default encryption key or set a custom one. Setting your own private key means not even Crashplan can decrypt your data, which is useful if you’re worried about hackers or government snoopers. Be wary that if you lose or forget your key, you can never decrypt your data and the backup will be effectively lost forever. Crashplan’s private data centers are located in the US, Japan, Ireland, Australia, and Singapore. You don’t get to choose in which country your data is stored, but most likely it will be transferred to the nearest server geographically. Recent changes in Safe Harbour policies are effecting how data transfers work between the EU and US as of the time of writing, so users in the affected countries should be aware of any possible ramifications. Crashplan’s desktop probably won’t win any design awards, but it’s intuitive and easy to find your way around. The Backup tab is a simple dashboard showing backup progress, destinations, what files are backed up, and any inbound backups from friends. The restore tab is a simple file explorer with a search function. Unfortunately, it doesn’t show previews of images or videos, so you just have to know what your looking for by the file name and other metadata. Each file has an additional file tree that drops down to show you previous versions available for backup. The settings tab includes all those tweaks mentioned earlier, while History keeps a log of backups. The Friends tab is where you control whose computers you’re backing up to and vice versa. Finally, Destinations is where you manage where backups are stored. The web app is pretty minimal, essentially just a file explorer that allows you to download zipped folders from your backup up to 250MB from any location. Here you can also manage destinations, friends, and account/billing preferences. The mobile app, available on Android and iOS, is one of the biggest letdowns for Crashplan. Only paid users get access to the app, but free users aren’t missing out on much. 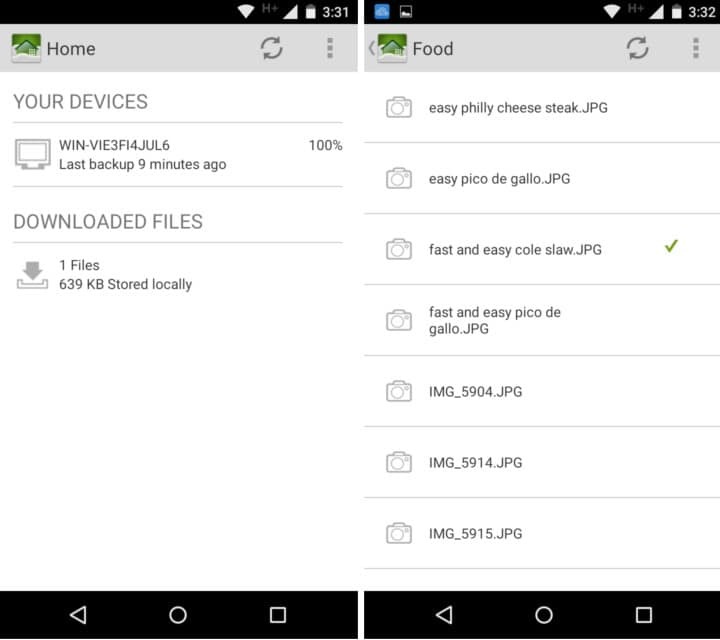 You can view and download files from your computer backup to your phone, but that’s about it. It won’t back up anything on your phone. It’s also missing a search function and, like the desktop app, doesn’t show previews or thumbnails of photos or videos. Crashplan’s website provides a thorough knowledge base, documentation, and user forums. Free tier users can submit tickets on the website and have their questions answered via email. Staff was slow to respond to a ticket we submitted during testing, but paid users can call Monday to Friday, 9 a.m. – 5 p.m. US Central Time. Domestic calls from inside the United States are free but international calls may incur extra charges. For the duration of our testing, Crashplan didn’t send a single unsolicited email. The app doesn’t pester users with upgrade promotions or other advertisements. Upon signing up, Crashplan promises not to pimp out your email to spammers, and the service seems entirely devoid of hidden fees and extra charges. If you decide to cancel your account, Crashplan guarantees it will refund you for any unused months remaining on your plan. Just be sure to cancel any active subscriptions before permanently deleting your account. Doing so takes just a few minutes. The desktop app doesn’t come with an uninstaller on Windows, but it’s easy enough to get rid of using the Add or Remove Programs utility. Crashplan is sure to entice a lot of users who want to utilize its robust free tier. The individual plan manages to stay competitive with unlimited storage, strong security, and high-degree of control. But Crashplan’s greatest value comes in its family plan. If you can scrounge together a few friends or family members to split the cost between 10 computers, Crashplan is a downright bargain. If you can overlook the mediocre mobile app and lack of sharing options, Crashplan is one of the most well-rounded backup options on the market with some unique features to boot.